We have recently completed the development of a digital training course for the British Safety Council, based on their existing Level 1 Award in Health & Safety at Work. This course has been developed as a cross-platform training package that can be delivered on-line via any browser, in a learning management system as a SCORM package and also as an iPad App (Android version to follow). The content has been structured as an interactive eWorkbook that allows learners to study at their own pace and in their own time. 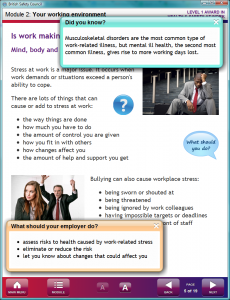 Each “page” of the eWorkbook contains text, images and a number of interactive elements including: case study videos, popup information, definitions, key facts and reminders, interactive questions and reflective activities where notes can be made. Everything the user types into their workbook is available next time they use it. 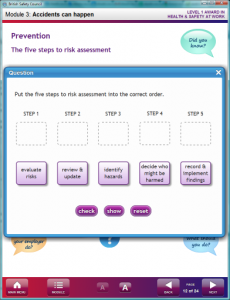 At the end of each module there is a module test base on the type of multiple choice questions that are used in the Level 1 accreditation. 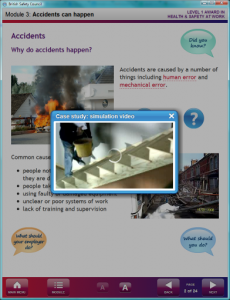 This digital training course was developed using Vivid’s X-Platform engine. This engine has been produced in-house over the last year and it enables content to be easily rendered across multiple platforms, including mobile. This means that only one version of the content needs to be developed for delivery on different platforms. Almost any content can be formatted quickly for delivery using our X-Platform engine, allowing the production of high quality, interactive, cost-effective digital courses from your existing content. Get in touch if you want to know how this can be used for your organisation. The British Safety Council is a global health, safety and environmental charity. They work with businesses to improve their health, safety and environmental management.